AP GO.140 DA 3.668% Sanctioned to AP Employees from 1st July 2016(Present DA 22.008%): AP #GO.140, Present DA 22.008%, #DA enhanced from 18.340% of the basic pay to 22.008% of basic pay from 1st of July, 2016, AP GO.140, Dt.11-08-2017, DA enhanced from 18.340% to 22.008% , Arrears : 1st July 2016 to August 31, 2017 to GPF, Cash from October, 2017, DA 3.668% enhanced from 18.340% to 22.008% from 1st of July, 2017. 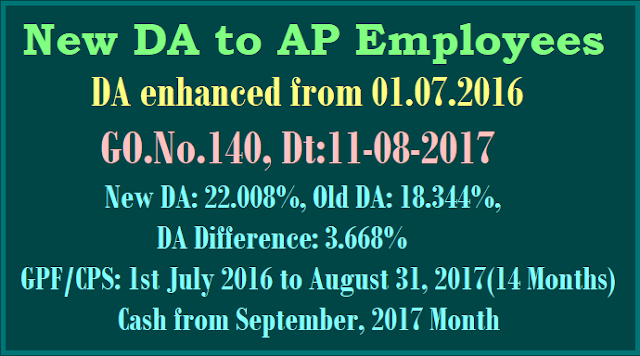 DA enhanced from 18.340% to 22.008%- #Present DA:22.008%: AP Government has sanctioned the Dearness Allowance (DA)(3.668%) to the employees of Government of Andhra Pradesh from 18.340% of the basic pay to 22.008% of basic pay from 1st of July, 2016. "DA shall be paid in cash with the salary of September, 2017 payable in the month of October, 2017"
GOVERNMENT OF ANDHRA PRADESH:: ALLOWANCES - Dearness Allowance - Dearness Allowance to the State Government Employees from 1st July 2016 - Sanctioned - Orders - Issued. ORDER: Government hereby order the revision of Dearness Allowance (DA) sanctioned in the Government Orders 8th read above to the employees of Government of Andhra Pradesh drawing pay scales in the A.P. Revised Pay Scales 2015, from 18.34% of the basic pay to 22.008% of basic pay from 1st July, 2016. 3. Government also hereby order the revision of Dearness Allowance rates in respect of State Government employees drawing the Revised U.G.C Pay Scales, 2006, from 125% to 132% of the basic pay with effect from 1st July, 2016. (ii) The Teaching staff of the Universities including the Acharya N.G. Ranga Agricultural University and the Jawaharlal Nehru Technological University and the Teaching staff of Govt. Polytechnics who are drawing pay in the Revised UGC/AICTE Pay Scales, 2006. (i) The Teaching and Non-Teaching staff of Government and Aided Affiliated Degree Colleges who are drawing pay in the Revised U.G.C Pay Scales, 2016. 5. Government also hereby order the revision of rates of Dearness Allowance in respect of Judicial Officers whose pay scales were revised as per Shri E. Padmanabhan Committee Report vide G.O. Ms. No.73, Law (LA&J SC-F) Department dated: 01.05.2010 from 125% to 132% of the basic pay with effect from 1st July 2016. 6. Government hereby order the revision of Dearness Allowance rate sanctioned in the G.O. 8th read above to the State Government employees in the Andhra Pradesh Revised Pay Scales 2010 from 93.304% of the basic pay to 99.296% of the basic pay with effect from 1st July, 2016 in the Revised Pay Scales of 2010.
i) The employees of Zilla Parishads, Mandal Parishads, Gram Panchayats, Municipalities, Municipal Corporations, Agricultural Market Committees and Zilla Grandhalaya Samsthas and Work Charged Establishment who are drawing pay in a regular scale of pay in the Revised Pay Scales, 2010. 7. Government also hereby sanction an ad-hoc increase of Rs.100/- per month in cash to the Part-Time Assistants and Village Revenue Assistants from 1st July, 2016.
shall be paid in cash with the salary of September, 2017 payable in the month of October, 2017. The arrears on account of payment of Dearness Allowance for the period from 1st July, 2016 to 31st August, 2017 shall be credited to the General Provident Fund Account of the respective employees in the month of October, 2017. 8.1. However, in the case of employees who are due to retire on or before 31st December, 2017 the arrears of Dearness Allowance shall be drawn and paid in cash as the employee due to retire on superannuation is exempted from making any subscription to the General Provident Fund during the last four months of service. 8.2. In respect of the employees who were appointed to Government service on or after 01.09.2004 and are governed by the Contributory Pension Scheme (CPS), out of the arrears payable for the period from 1st July, 2016 to 31st August, 2017, 10% shall be credited to the PRAN accounts of the individuals along with the government share as per G.O.Ms.No.250, Finance (Pen.I) Department, dated: 06-09-2012 and the remaining 90% of arrears shall be paid in cash in the month of October, 2017. 8.3. In the event of death of any employee before the issue of these orders, the legal heir(s) shall be entitled to the arrears of Dearness allowance in cash. ➧GPF: 1st July 2016 to August 31, 2017(14 Months). ➧CPS: 10% of DA Arrears from 1st July 2016 to August 31, 2017. 9. The term ‘Pay’ for this purpose shall be as defined in F.R.9 (21) (a) (i). case of an employee who has opened a General Provident Fund Account in the month of October, 2017. 9.2. Bills for the adjustment of arrears of Dearness Allowance to the Compulsory Savings Account as per para 8.2, shall be presented at the same time as bills for crediting the arrears of Dearness Allowance to the General Provident Fund Account as per para 8. & Accounts Officer or Pay and Accounts Officer of the Andhra Pradesh Works Accounts Service/District Treasury Officer/Sub-Treasury Officer shall follow the usual procedure of furnishing one copy of the schedules along with bills to the Accountant General based on which the Accountant General shall credit the amounts to the General Provident Fund Accounts of the individuals concerned. The second copy of the schedules shall be furnished to the Drawing Officers with Voucher Numbers. 11. All Drawing Officers are requested to ensure that the bills as per the above orders are drawn and the amounts credited to General Provident Fund Account by 31st October, 2017 at the latest. The Audit Officers (Pay & Accounts Officer, Deputy Directors of District Treasuries and Pay & Accounts Officer of Andhra Pradesh Works Accounts Service, etc.) are requested not to admit the pay bills of the Office concerned for the month of November 2017 unless a certificate is enclosed to the bills to the effect that the arrears of difference in Dearness Allowance for the period from 1st July, 2016 to 31st August, 2017 are drawn and credited to the General Provident Fund Account before 31st October, 2017. 12. In respect of employees working in Government Offices under his audit control, the Pay and Accounts Officer shall consolidate and furnish information in the proforma annexed (Annexure-I) to this order to the Finance (HR.VI) Department to reach on or before 30th November, 2017. 13. All the Audit Officers (Sub-Treasury Officers) are requested to furnish the figures of the amount credited to the General Provident Fund Account and the amounts credited to Compulsory Savings Account in the prescribed proforma (Annexure-I) enclosed, to the District Treasury by the end of 30th November, 2017. 14. The Deputy Directors of District Treasuries in turn shall consolidate the information and furnish the same in the same proforma to the Director of Treasuries and Accounts by 31st December, 2017, and who in turn, shall furnish the information to Government by 31st January, 2018. 15. In respect of employees of Local Bodies, the Drawing Officers shall furnish the above information in the prescribed proforma as per Annexure-I to the Audit Officer of the District concerned before 30th November, 2017 and who will, in turn furnish the consolidated information to the Director of State Audit by 31st December, 2017. The Director of State Audit in turn shall furnish the consolidated information to the Secretary to Government, Finance (HR.VI) Department by 31st December, 2017. 16. In regard to the Project Staff, the Joint Director of Accounts of each Project shall furnish the information in the prescribed proforma as per Annexure- I to the Director of Works Accounts by 30th November, 2017, and who, in turn, shall furnish the information to the Finance (HR.VI) Department by 31st January, 2018. 18. All Heads of the Departments and Departments of Secretariat are requested to issue suitable instructions to the Drawing and Disbursing Officers under their control and to see that these instructions are followed scrupulously. The Director of Treasuries and Accounts/Director of State Audit/Pay & Accounts Officer/Director of Works Accounts, Andhra Pradesh, Hyderabad, are requested to issue suitable instructions to their subordinate Audit Officers so that these instructions are carefully followed by them. 19. The expenditure on the Dearness Allowance to the employees of Agricultural Market Committees, Greater Visakhapatnam Municipal Corporation and Vijayawada Municipal Corporation shall be met from their own funds in view of the orders issued vide G.O.Ms.No.9, Finance (PC.I) Department, dated: 18-01-2010. 20. The G.O. is available and can be downloaded from here.